This home is move in ready, with brand new carpet upstairs in the living room and all of the bedrooms. You will find that this cute rambler with basement is great for anyone. Downstairs you will find a great room, wet bar, and room for guests or office. You will also find a full sized laundry room and two large storage areas downstairs. You have privacy in the back yard with the Green belt behind you. The street is a quite cul-de-sac with only a few neighbors. 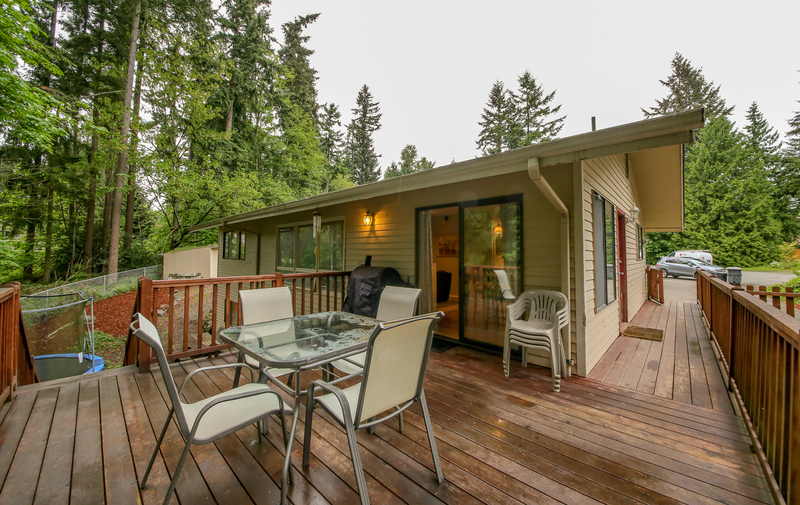 You can enjoy a meal or simply sip a drink while enjoying the deck off the back of the home. Don’t want to bother the family you can walk around the side as the deck goes all the way to the front of the home. The steps will take you down to a back yard that is waiting for your imagination to make it something specifically to fit your needs. The backyard is fully fenced so you can keep in what you need to keep in and keep out what needs to stay out. Need parking? This home supports parking for 5 cars. If you have an RV you could use the side parking for that. This market is a HOT one and this super cute house will not last long. Come home to this full lake access home. DID YOU SEE THE NEW ANNOUNCEMENT!!!??? Thanks to YOUR feedback, we’re thrilled to announce that in the coming weeks, your eEdge myMarketing system will be undergoing an exciting upgrade. Do you have any active campaigns? We will be migrating your existing campaigns to the new system July 21-23. Interval campaigns (campaigns with an assigned number of days between steps) will be paused July 21, 22 and 23 but will resume on their regular schedule on July 24 without skipping any steps. No action is required for interval campaigns. YOUR ACTION REQUIRED – If you have any date-based campaigns (campaigns with specific dates assigned to each step) that includes a step scheduled to go out on July 21, 22 or 23, you must change that send date to July 24 or later or that step will be skipped. Click here for a step-by-step guide to walk you through the process. Are you planning on ordering print materials? To make way for the new myMarketing system, you will be unable to complete any print orders between July 18 and July 23. To ensure that you have the printed materials you need, please submit your print orders by July 17. Have you uploaded or purchased any mailing lists? If you wish to reuse uploaded or purchased mailing lists, you must save them, upload the records as contacts and add them to a group by July 22. Click here for a step-by-step guide to walk you through the process. The purchase mailing list feature was recently disabled while we work with our mailing list vendor to integrate this functionality with the new myMarketing. We regret that purchasing and uploading mailing lists will not be available at launch. YOUR ACTION REQUIRED – You must save your purchased or uploaded mailing lists by July 22. We are confident that you will find the new myMarketing well worth the effort and truly appreciate your time in completing these tasks. We are thrilled to unveil the new myMarketing very soon and know you will notice the difference it will bring to your business. As always, we’re here to support you in any way we can. You can win 50,000 dollars just by download my KW app and entering the code to active. Your odds of winning are better than the lotto!! Every device you load it on is another entry in the contest. This app is the most innovative real estate app on the market so it’s really worth the 3 min it may take you to load it. All you have to do is DOWNLOAD my app and ENTER the code for ME to activate all the features and you will be entered into the contest!!! You may not be searching for a home right now, but who isn’t interested in what’s going on around them. My app will show you sold in the area and what is currently for sale. You can also follow these steps to download. Step one go to the app store (Apple and android) and down load the Keller Williams app, it’s red with white KW. Then when you have the app open on the bottom you should see my picture and it will say your agent is Amanda Smith. This is going to change to On The Edge RE soon so don’t freak out. THANK YOU ALL SO MUCH FOR YOUR HELP AND I HOPE YOU WIN!!! If you haven’t liked my page please do so!! Tagged $50, 000 app contest, app, best real estate app, download app, How to download KW app, Keller Williams app, KW App, real estate app, Win!